Driving in the snow does not need to be daunting as long as you take your time and understand how to fit snow chains to your car. However, it is compulsory to carry properly-fitting snow chains if you are driving a two-wheel-drive vehicle in the Kosciusko National Park. This is required between the June and October long weekends. 4WD vehicles are not required by law to carry snow chains but due to the high incidence of 4WD vehicle accidents in Kosciuszko National Park, Roads and Maritime Services NSW (RMS) now recommend 4WD carry chains especially if drivers have little experience driving in snow/ice risk sections. Snow chains should be fitted as directed by authorised National Parks and Wildlife Service (NPWS), RMS and NSW Police personnel. Chains can be hired at many service stations and ski hire shops in Jindabyne, Cooma and throughout the Snowy Mountains region. Motorists are legally required to carry properly fitting chains in any vehicle other than 4WD’s in a ‘snow-ice’ risk section within the National Park and must be hired at your own expense. Pick up your snow chains at a service station on your way and if you have not had any experience fitting snow chains, ensure you are shown how to fit the chains to your vehicle before you head up the mountain. Approximate charges are $40 for 2 days hire and $51 for 5 days hire. Driving in the snow requires all your attention and can often cause tiredness, particularly when conditions demand a high level of concentration. Remember to be patient and enjoy your trip. When driving in snowy or icy conditions, leave double the normal distance between you and the car in front. Don’t break hard and avoid sharp steering movements: stopping on icy roads takes a lot longer. The speed limit in many areas of Kosciuszko National Park is reduced to 80 km/h during winter. Take extra care around snow ploughs. They may be operating on the wrong side of the road and are not easily manoeuvrable. To protect your vehicle ensure that your radiator has effective antifreeze. If in doubt, have your service station perform an electrolyte test. If you drive a diesel vehicle you will need a ‘winter’ diesel mix. Winter mix has special additives which stop the fuel freezing. If you still have plenty of fuel in your tank on arrival in the mountains, it may be sufficient to top it up and run the vehicle for 10 to 20 minutes. Check with a local service station. Please remember that when you are driving on snow or in icy conditions it is very different from driving in normal or dry conditions and the number one rule is GO SLOWLY and KEEP YOUR DISTANCE from other cars in front of you! 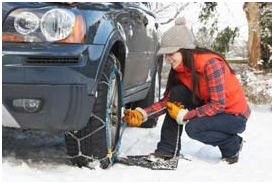 Be sure to carry snow chains in your vehicle at all times during the snow season. DRIVE SLOWLY and use your gears to SLOW DOWN when you are driving in the snow or in icy conditions. You need to be prepared to fit or install snow chains to your vehicle when directed by authorities. It should also be noted that in many cases erected signs are in place to direct drivers when chains are required to be fitted. Ensure that the chains you are going to carry to the snow fit the vehicle and you have been shown how to put them on before you leave to visit the snow. Contact Transport Management Traffic Information on 132 701 and follow the prompts for current road conditions in the NSW Snowy Mountains.